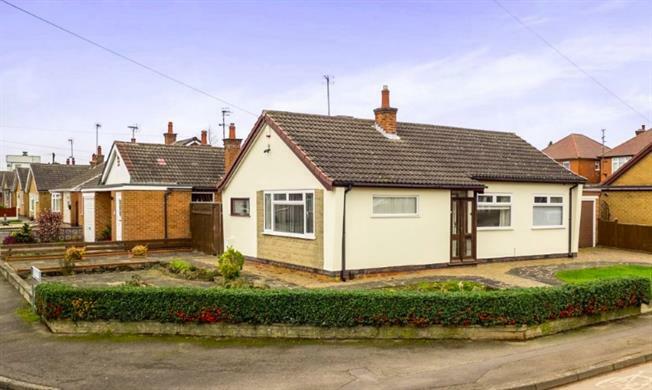 3 Bedroom Detached Bungalow For Sale in Nottingham for Guide Price £180,000. This detached bungalow offers ample space both inside and out. Situated on a generous corner plot your options are endless. The accommodation briefly comprises: a welcoming entrance hall; spacious lounge which benefits from double aspect windows, kitchen that gives access to the rear, recently fitted shower/wet room and three bedrooms. To the rear you have an enclosed private garden/patio area with 8 by 10 shed and separate detached garage plus ample off road parking space. Double radiator and ceiling light. Access to the lounge, kitchen, shower room and all three bedrooms. Double aspect double glazed uPVC windows facing the front and side. Gas fire and onyx surround, double radiator, carpeted flooring, and ceiling light. Double glazed uPVC window looking out on the side garden. Double glazed uPVC window facing the rear overlooking the patio. Double radiator, Fluorescent strip ceiling lights. Roll edge work surface, wall and base units, double sink and with mixer tap, spaces for oven and hob, dishwasher, washing machine and fridge freezer. Double size bedroom; double glazed uPVC window facing the rear overlooking the patio with black out blind set for optimum light/privacy. Fitted wardrobes along the wall. Bedside fitted wall lights set each side of the bed. Double radiator, carpeted flooring, built-in wardrobes and ceiling light. Double bedroom; double glazed uPVC window facing the front with with black out blind set for optimum light/privacy. Fitted wardrobes along one wall. Bedside fitted wall light set above the bed. Double radiator, carpeted flooring, built-in wardrobes and ceiling light. Single sized bedroom double glazed uPVC window facing the front with light blind set for optimum light/semi-privacy Gorilla floor covering matching hallway ; bathroom and kitchen for continuity. Fitted wall light. Modern shower room with double glazed uPVC window with patterned glass. Double radiator and ceiling light. Low level WC, double enclosure shower and wash hand basin.